A few months ago, I was working at my desk while the radio played in the background. All of a sudden, I heard something extraordinary. I had been vaguely aware of some orchestral music that suggested foreboding and sorrow, but then I heard a choir of women’s voices singing a haunting melody. I stopped work to listen. Every so often, there was a swishing noise from the orchestra, the voices seemed to hesitate, but they continued, more quietly each time. Eventually there were only three voices. Swish. Then two. Swish. Then one. Swish. A few more chords from the orchestra, followed by silence. I didn’t know what I had just heard, but I was almost in tears. After a pause, the announcer explained that this was the final scene from François Poulenc’s opera, Dialogues des Carmélites. 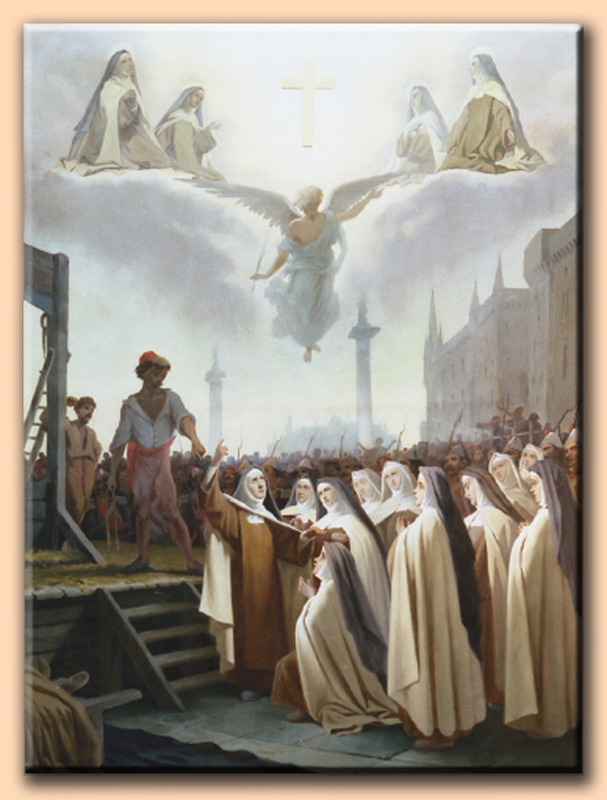 The music depicted a real event – the death by guillotine of 16 Carmelite nuns during the Terror in 1794. 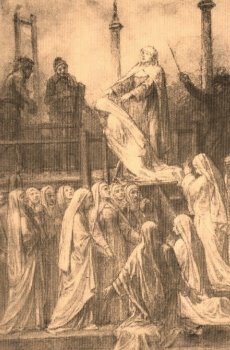 The nuns had stood at the foot of the scaffold, singing the Salve Regina and the Veni Creator Spiritus, while one by one they mounted to the top and were executed. The announcer also said that the opera was to be performed in Toronto by the Canadian Opera Company. So, this past May, Norman and I went. The production, directed by Robert Carsen, was superb. 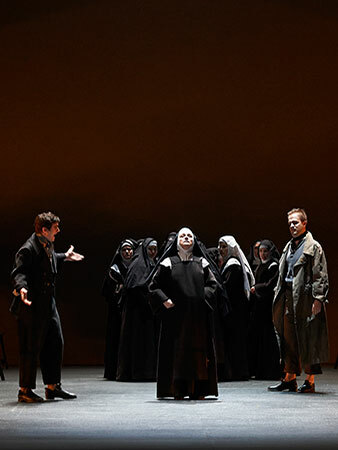 The story focuses on an aristocratic but timid young woman called Blanche de la Force (played by Isabel Bayrakdarian in the opera) who joins the Carmelites of Compiègne just as the French Revolution is beginning. In the convent, she befriends the dying prioress Madame de Croissy and a high-spirited novice called Constance. When Revolutionaries close the convent and expel the nuns, Blanche flees. The remaining nuns choose to face martyrdom together rather than disbanding. The nuns are condemned to death for sedition. On the day of their execution in Paris, Blanche stands in the crowd, watching. At the end, only her friend Constance is left. At the last moment, Blanche walks forward to accept the same fate as her Carmelite sisters. I continued to think about the performance for a long time afterwards. As usual, I wanted to know what had really happened. I knew from the opera program that Blanche was a fictional character created by the novelist Gertrud von Le Fort (she even gave her heroine a French version of her own last name: von Le Fort became de la Force), but she had set her story against the backdrop of historic events. The novel, translated into English as Song at the Scaffold, was transformed into a screenplay by the Catholic writer Georges Bernanos shortly before his death in 1948 and into an opera by Poulenc in 1956. It was first performed in Italian at La Scala in 1957. First, I went looking for the convent. It is long gone, but it stood near the river Oise in Compiègne, close to the royal chateau and park. It was built in the 1640s and destroyed in the early 1800s. Today, the Imperial Theatre stands on the site of the chapel and the Ecole d’Etat-major (a military school for officers) occupies the space that provided living quarters for the nuns. 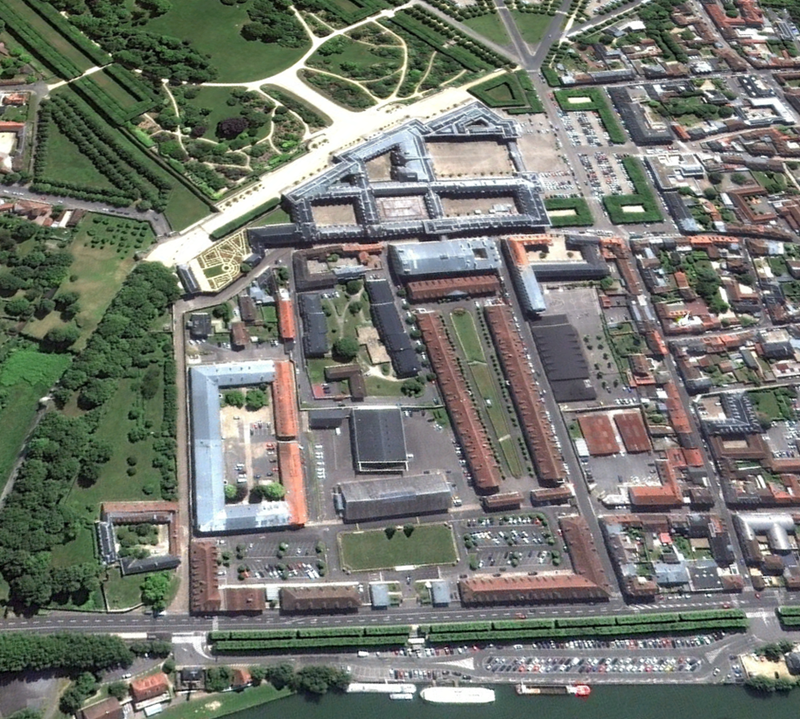 In this picture from Google Earth, taken looking southeast, the military school occupies the foreground facing the river, and the theatre is the rectangular building with the silvery-grey roof in the middle distance. The Chateau of Compiègne lies immediately beyond, facing the formal park. The guillotine was first moved to the poor quarter of the Place de la Bastille, where it was indignantly rejected by the residents of that vociferous neighbourhood. 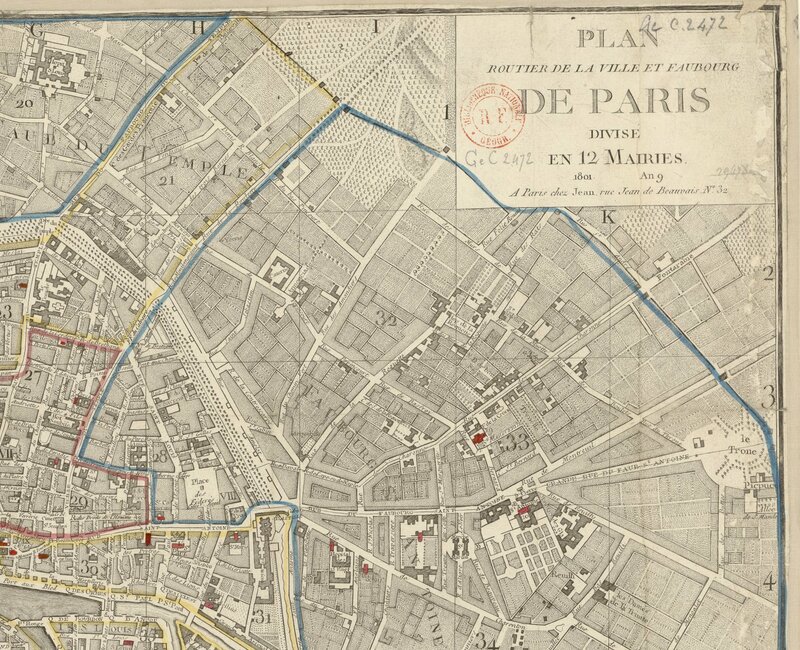 It was finally moved to the Place du Trône [by that time called Place du Trône Renversé or Place of the Overturned Throne], now known as the Place de la Nation, a vast unvisited public square…at the remotest end of the rue du Faubourg St. Antoine. Far from the sight of respectable property owners, yet publicly displayed for the benefit of those who enjoyed watching the executions, the guillotine could here unapologetically go about its business. A map from about 1800 shows the site, surrounded by fields (it is at the very far right of this image). The bodies were dumped in a pit nearby, which is now part of the Cemetery of Picpus (or Piquepuce, meaning fleabite). 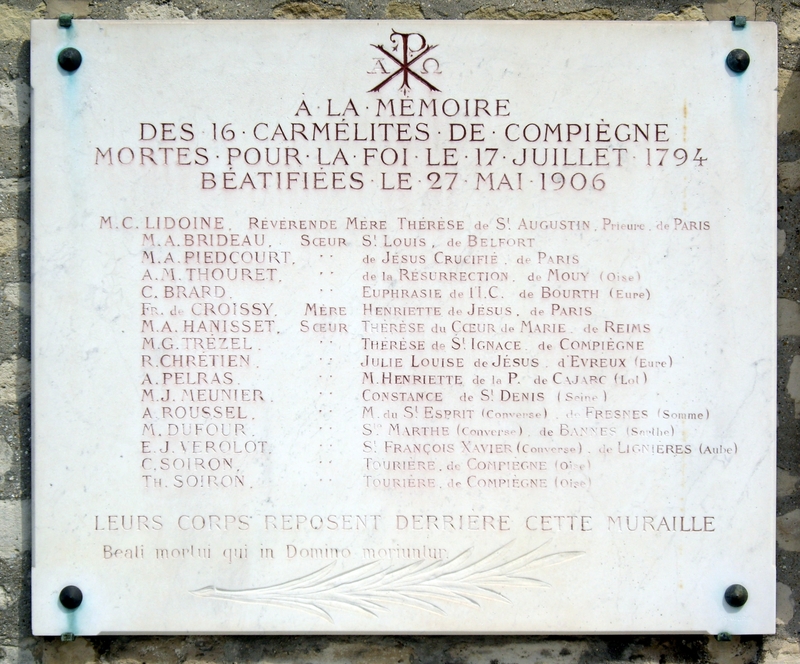 Today, a memorial to the 16 Carmelites can be seen in the cemetery. The tablet includes the name de Croissy. 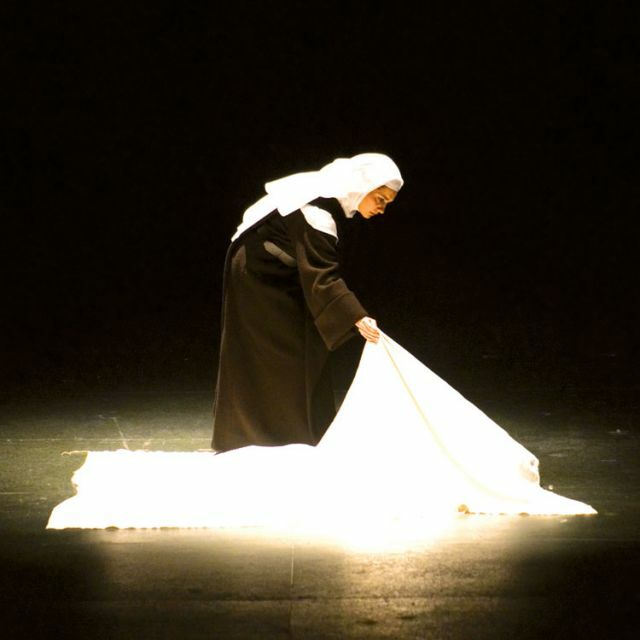 In the opera, the Prioress de Croissy dies in a harrowing scene at the end of the first act, before the Revolution encroaches on the convent. But the real Madame de Croissy died on the guillotine with her sisters. According to Carmelite tradition, a Reverend Mother serves for only a limited term, after which an election takes place for a successor. This had happened before the Revolution began, and the office of Prioress had been transferred to Madame Lidoine, who is listed as Reverend Mother on the tablet. You can also see the name Constance of Saint Denis, the novice. She was a real person. Her name at birth was Marie-Geneviève Meunier, born at St-Denis in 1765, so she was 29 when she died. She had been unable to take her final vows, since religious orders had been suppressed during the Revolution. Although in the opera, she was the last to die, in truth she was the first (the Reverend Mother Lidoine was the last) and she pronounced her vows to her superior just before mounting the scaffold. So what, exactly, happened? In 1790, the new Revolutionary government decided to abolish religious orders, for a number of reasons. For one thing, many religious orders had strong ties to the monarchy and tended to be royalist. For another, the Revolutionaries felt that human reason was the ultimate authority, not religion, and priests, monks, and nuns had no part in their world. And finally, there was a practical reason: the government needed money, and those churches, convents, and monasteries represented wealth they could seize – from agricultural estates to gold and silver vessels. Orders that provided services such as nursing or teaching were not targeted at first, but the Carmelites were a contemplative order – their vocation was prayer and meditation. In 1792, all contemplative nuns and monks were expelled from their convents or monasteries, forced to wear civilian clothing, and required to swear an oath of loyalty to the state. All across France, monks and nuns faced three options: return to secular life, go into exile and join an order in another country, or continue the religious life in hiding. The Carmelite nuns in Compiègne took a somewhat different path. They split into four groups and took lodgings in the town. Although they wore secular clothing, they continued as much as possible to live a contemplative life, attending mass at the church of St-Antoine in Compiègne. It seems they did not make much attempt to conceal what they were doing. For two years, they continued in this way. They were arrested in June 1794 and taken to Paris for trial, accused of conspiring against the state and of religious fanaticism (one nun asked the judge who was the real fanatic). Reverend Mother Lidoine tried to take full responsibility and spare the others, but all 16 who had been arrested were condemned to death. Three other nuns who had not been in Compiègne at the time of the arrest escaped, including one who wrote a memoir about her experiences. An interesting historical detail is that at their trial and execution, the nuns were wearing their habits, despite the prohibition against religious clothing. It turns out that when they were imprisoned in Compiègne they asked for permission to wash their clothes. In the meantime, they put on the only other things they had: their Carmelite habits. Just as their civilian clothes were soaking wet, the order came through that they were to be taken to Paris. Therefore the pictures of the nuns going to the guillotine in their habits are accurate – with one exception. They wore white caps, instead of the wimples and veils most images show. Their executioners demanded bare necks. Why did they have to die? What difference did it make to the Revolution if this group of women in a small town 70 kilometres away from Paris continued to pray and attend mass? There are two ways of thinking about it. From the Revolutionaries’ point of view, this form of passive resistance was unacceptable. The nuns would not submit to the authorities; they had to be punished for insubordination. Some personal motives also played a part. The mayor of Compiègne, who was anxious to curry favour with the authorities, hastened their arrest to indicate his loyalty to the Revolutionary cause. Another view is that the nuns chose to be martyrs. They believed that by sacrificing themselves, they could help save France. Certainly, at their execution, the sight of their habits and the sound of their singing silenced (for the first time) the jeering mob in the Place de la Nation. The nuns’ serenity must have made at least some observers feel a compunction they had not felt when watching others die. And, indeed, ten days after they died, the Terror came to an end with the execution of Robespierre. His downfall had already been set in motion when the nuns mounted the scaffold, but who is to say that the manner of their death did not help change attitudes and hasten his end? 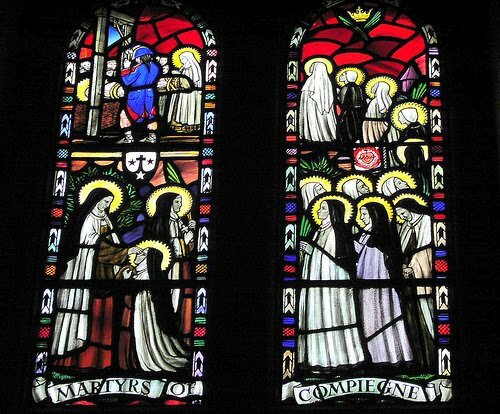 In 1906, the Carmelites of Compiègne were beatified by the Catholic church (they have not been canonized, so they are not considered saints). To some, their story is beautiful; to others it is merely sorrowful. But thanks to the genius of Poulenc, their story will never be forgotten. Text by Philippa Campsie. Images from Google Earth, Gallica, Wikipedia, and the Canadian Opera Company. To hear the final scene from the opera, click here. I chose this YouTube version because it includes the full orchestral prelude to the scene and because it does not show the staging; it is intended for listening only. William Bush, Bernanos’ « Dialogues des Carmelites » : Fact and Fiction, Carmel de Compiègne, 1985. Steven Payne, The Carmelite Tradition: Spirituality in History, Liturgical Press, 2011. Peter Thomas Rohrbach, Journey to Carith: The Story of the Carmelite Order, Doubleday, 1966. This entry was posted in Paris history, Paris music and tagged Canadian Opera Company, Compiegne, Constance of Saint Denis, Dialogues des Carmelites, Francois Poulenc, French Revolution, Georges Bernanos, Gertrud von le Fort, Isabel Bayrakdarian, Madame de Croissy, Madame Lidoine, Martyrs of Compiegne, Paris in the Terror, Place de la Nation, Robert Carsen, Robespierre, Song at the Scaffold, Stanley Loomis, William Bush. Bookmark the permalink. Great post, perfect reading for a gloomy evening in cold wet Paris. What an amazing story! Thank you for sharing this piece of history that speaks to the bravery of these women against the ignorance and violence of the period. Utterly fascinating! This very interesting post makes me regret not taking my neighbor up on an offer of a free ticket to see the Met Opera’s version of the opera this season. Pity. I would have been interested to hear about their staging, which was completely different from the COC staging, I understand. Thank you for sharing this. I’d never heard this story. I didn’t even know that the guillotine was moved. It’s odd to think that even during a period like the Revolution, the affluent types in the centre of town successfully protested against having the guillotine in their neighbourhood! Hi there I love your blog which I have been following on our desktop PC at this address < tdbl@shaw.ca). I now want to change to my iPad email which is and have been having problems. I received only one, Tne Nun’s Tale, which came into both addresses. The latest issue, An honourable education was delivered to the shaw.ca address only. I want to delete that address once I am sure the icloud.com will work. Just now I rejoined on your site from the Apple address, and though was told there’d be a confirmation email, nothing has come in. Sorry for being a nuisance. Can you help me with this? Or do you think Apple has filters to screen out bulk mailings? Thank you for this lovely blog entry. I have just finished Edward Rutherfurd’s Paris and he mentions the nuns in passing. Timely to have a fuller account to hand. the Poulenc except was very moving. Do you recommend the Rutherfurd book? I’d be interested in your thoughts. I considered taking it as airplane reading, but it looked to heavy to lug to Paris and back! By the way, the beatified of the Catholic Church are saints. The process of canonization proceeds through the levels of Servant of God, Venerable, Beatified, and Canonized, but the definition of their sainthood is that they are in Heaven: everyone in Heaven is a saint. I’d also recommend the book, To Quell the Terror by William Bush, which tells the true story of the Carmelites of Compiegne, including their connection to the members of a house of English Benedictines, now at Stanbrook Abbey, which had been founded in France by Helen More, the great-great-granddaughter of St. Thomas More. Thank you for the clarification about saints. I remember reading about the link to the English Benedictines, who have some of the clothing once worn by the Carmelites. And wasn’t it Stanbrook that Rumer Godden used as a model for the abbey in her book “In This House of Brede”? Yes, you are correct about Rumer Godden’s model; she lived quite near the Abbey and visited often to experience the nuns’ way of life in the cloister. Your blog is wonderful! Thank you for the excellent posts. I had looked for Librairie Charlemagne last autumn in the Marais and did not know it had closed. My husband and I are planning another trip to Paris next March and have been missing Paris so much. I very much enjoyed this thought-provoking post. Thank you. Thank you for your comment. Many nuns left the country during this period and went into exile. Very few of them returned to secular life, as they were ordered to do by the authorities (although quite a few monks did so, taking the pensions offered to them). The exiles included some nuns who had originally left England because of the persecution of Catholics in that country that began with the dissolution of the monasteries in the 16th century. I don’t know of any individual stories, but I am sure that an online search will turn up a few. Bastille Day, as a celebration of freedom, has lost its meaning to me. These women were not subversive and had right to religious freedom. From now on , i will remember this day as when angry crowds were joyously anticipating their death. What they did took courage, and I appreciate your research. They were never canonized. Do you know why? Is this because of fear of offending the French? It’s a good question, and you may be right. As for the attitudes of the crowds, a kind of mass hysteria seems to have taken over during the Terror that is frightening and hard to understand.